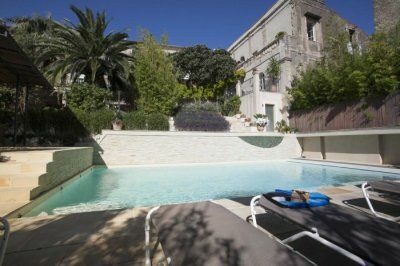 Description of Property: The house was built in the early 1800s by one of Napoleon's generals who lived in the south of France. Italianate in style, with ornate balustrades, columns and carved stonework, the house has been fully renovated. 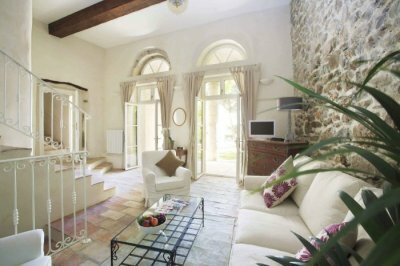 Today, 'La Grande Maison' (as it is known in the village) forms the perfect venue for our self-catering accommodation. In our second-floor suites, the original 'Encaustic' tiles, in shades of turquoise, burgundy, olive and pink, have all been restored. 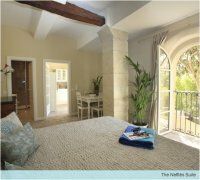 On the ground floor, our Pézenas and Neffiès suites feature exposed stonework and wooden beams, along with many other original features. Nine luxury holiday suites are available offering fully self-catering accommodation for our guests. 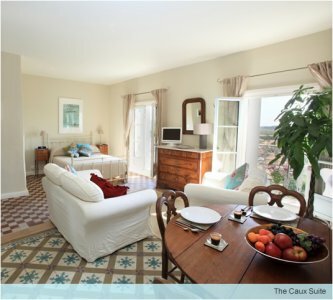 All of the suites comprise a bedroom, sitting room, bath or shower room, and a kitchen. Each is furnished to a very high standard with everything you might need. 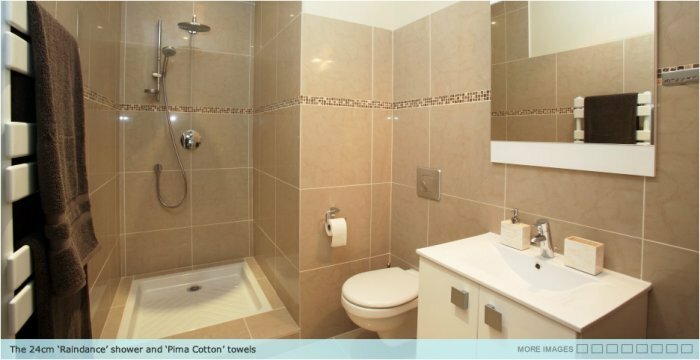 For example, en-suite shower rooms feature spacious showers with large 'Raindance' heads, and luxuriously-soft towels. Our kitchens have been similarly equipped to meet the demands of today's modern traveller. 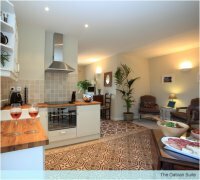 Each features a spacious combination oven-microwave, fridge-freezer, Nespresso coffee machine, a full range of cooking equipment. Six of our suites are equipped with dishwashers. All offer crockery, glasses and cutlery for four people - allowing you to entertain should you want. Such little modern necessities combine with all sorts of traditional touches - from original 'Encaustic' tiled floors to exposed wood beams and stone walls. Each suite also offers views beyond our guesthouse of the surrounding countryside. Outside Amenities: The garden descends on three terraces, each framed by planters filled with lavender. On the second level is the lounge and summer kitchen - also shaded. It's here that you may want to retreat each evening with a glass of chilled rosé. Below this level is the pool and sun-bathing areas. In keeping with Languedoc's hot, dry weather, the garden is stocked with indigenous Mediterranean plants and herbs - providing plenty of colour and scent throughout the year. We can also offer guests use of the 1st floor terrace which has sofas and comfortable chairs on which you can relax and read (weather permitting). On the first floor is a large shared kitchen and dining room which you can use should you want to throw a larger party. Surrounding Area: Roujan is the biggest and buzziest of the small wine-making villages that encircle Pézenas. The village's 'raison d'être' is wine - vineyards spread out as far as the eye can see, and much of the populace is involved in the growing and harvesting of grapes and the production of the 'Coteaux du Languedoc' vintages produced here. The village offers two excellent bakeries, two supermarkets, two butchers, a pharmacy, post office, ATM and two café / bars. Roujan also gives you easy access to superb walks (through the vines or 'garrigue') and bike rides (we can lend you bikes). There's also a village tennis court should you fancy a game - and we'd be happy to lend you racquets and balls. Pézenas was once the capital of Languedoc, back in the 1600s. Today, evidence of the town's past importance is visible everywhere - in the impressive, stone-carved façades of the town's buildings - decorated with gargoyles, ornate balconies and heavy wooden doors. Hugely popular with holiday makers and residents alike, Pézenas has always proven a big hit with our friends - with its maze of interesting shops, good restaurants, and on-street cafés. The Saturday morning market is now legendary, and a great place to sample scores of local cheeses, tapenades and charcuterie. This is only 10 mins drive away. Conventional oven. Hob. Microwave. Fridge. Freezer. Combined Fridge/Freezer. Dishwasher. Washing Machine. Tumble Dryer. Pets may be allowed by prior agreement. BBQ. Pool. Suitable storage facilities are available for furniture etc. Pool is not heated off-season. Property is suitable for more than one family. Off-road parking. Pricing Info: We require a 30% booking deposit to confirm your booking and payment for each month stay made one month prior to the beginning of that month. The price includes linen and towels and water. Cleaning of the suite and laundering of the linen & towels is extra (charged as required).